The multipurpose disinfection solution Opti-free ever moist in its practical Flightpack takes care of your eyes on travels, being especially effective and gentle. The patented formula retains moisture for up to 16 hours and keeps your contact lenses fresh day after day. A cushion of moisture is created as soon as they are worn, ensuring an extraordinary amount of comfort up until the moment they are taken out. This solution is an excellent choice for those who suffer sensitive and dry eyes. The gentle nature of the ever moist solution prevents any red eyes. Hygiene and protection should be number one priorities where your eyes are concerned. The biocompatible disinfection agent in the solution actively prevents eye infection. Germs and bacteria are quickly and reliably prevented and removed. Thanks to the daily removal of lipid and protein deposits, Opti-Free ensures continuous clear vision. Comfort, hygiene, protection and safekeeping are all made especially uncomplicated and efficient, thanks to the simple to use application of Opti-Free ever moist. Opti-Free ever moist was specially developed for the care of soft and silicon hydrogel contact lenses. The high levels of maintenance required for these lenses are granted thanks to the special composition of the solution. It contains 0.001% Polyquad® ( Polyquaternium -1) as well as 0.0006% Aldox® (Myristamidopropyldimethylamin) as a preservative. The ever moist Flightpack from Opti-Free can be taken onto flights as hand luggage, being perfectly suited for long flights. 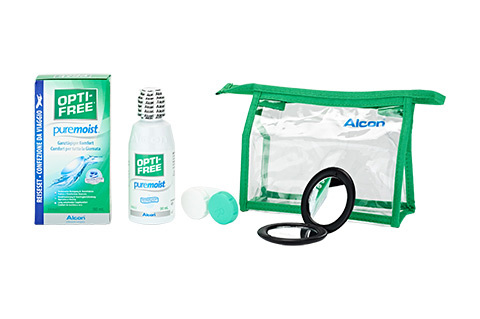 The solution comes with a contact lenses case for the cleaning and safekeeping of your contact lenses included.